Golden Sky Liverpool FC : Are Rainbow Laces Enough? 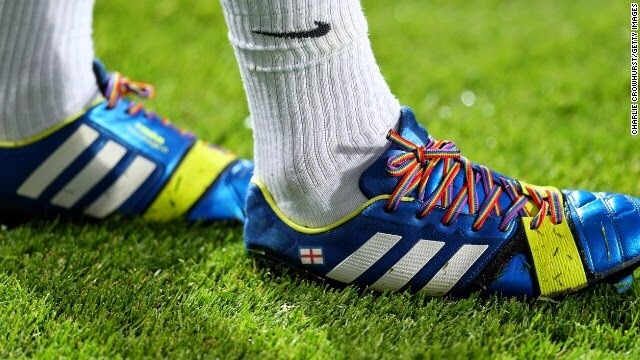 As the rainbow laces campaign kicks off for its second year, we ask are laces and T-Shirts enough in the fight against bigotry at our grounds and in our sport. I suggest not but they are a start and are raising the profile and therefor helping, we are all aware of the issues affecting our sportsmen through people like Gareth Thomas capped over 100 times and former captain of Wales rugby union team, who suffered incredibly, culminating in a suicide attempt before he found the incredible courage to come out as an openly gay man. We are aware of the issues surrounding Graeme Le Saux who was wrongly accused of being gay and suffered taunts from supporters and players alike for a number of years including our own Robbie Fowler who later apologised for an embarrassing incident. We are all aware of terrible incidents of racism that have been directed at players, officials, and fellow supporters. We are all aware of the fellow supporters who are bigots who shout out abusive, racist, unacceptable comments on a weekly basis but do we ever do anything about any of the above? Very few of us and very rarely. We have all heard the old boys at the match calling players a puff for picking up or faking an injury, we have all heard the kids at the game saying that the refs incorrect decision "was gay" have we ever pulled anybody up on these comments? Probably not, should we, without a doubt. We need to change attitudes to change people and peoples perceptions of us as supporters and of our game. Will the admittedly witty television advert by the Arsenal team and players wearing rainbow laces stop this happening? No it won't, but at least it is raising the questions, at least we are discussing it, at least you are reading this and thinking about the issues and that is a start. A start of changing how people behave and I think is a big thing. Are laces enough, I think they are raising the profile, they have managed to get on television and in the national press but will we notice individual players wearing them or should it be something more noticeable such as an armband, I'm not sure but I think the biggest boost for the campaign would be high profile players showing their support and if we miss one person the campaign misses out. I suspect that if television doesn't cover the individual players their laces could be missed by people, everybody in the ground would see an armband, starting discussion and debate. Players supporting this campaign is vital, there are undoubtably gay men involved in the game at all levels and in all roles, as currently non of them are openly gay we can only presume that individuals do not feel comfortable or safe in coming out and we can only hope that nobody is suffering as Gareth Thomas describes in his book. One of the only ways I can see things changing is through individual players and supporters showing their support and making it known that they support this campaign, if players show their support supporters and the wider public will follow, hopefully one day leaving the bigots in the minority and the ones left feeling uncomfortable and unwanted. It is time, actually way past time, that we stand up against the people who think our football grounds are places to voice their prejudices and that our game is the place to voice their bigotry, it's not, football is for everybody whether you play, or support everybody should be allowed to enjoy the game in a comfortable and safe environment. So please get behind this campaign and others like it, show your support. One day we will all be able to enjoy football, the game and our club will be better for it.